Scantrol AHC for Dynacon LARS. Schulte Marine Concept: First Cruise Newbuild. Shell opens lubricants plant in Singapore. 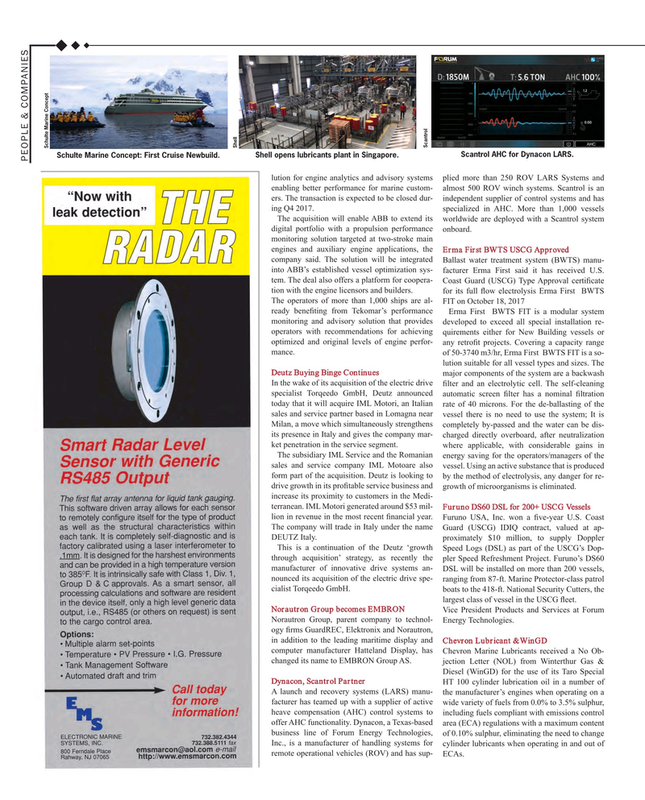 PEOPLE & COMPANIES lution for engine analytics and advisory systems plied more than 250 ROV LARS Systems and enabling better performance for marine custom- almost 500 ROV winch systems. Scantrol is an ers. The transaction is expected to be closed dur- independent supplier of control systems and has ing Q4 2017. The subsidiary IML Service and the Romanian energy saving for the operators/managers of the sales and service company IML Motoare also vessel. Using an active substance that is produced form part of the acquisition. Deutz is looking to by the method of electrolysis, any danger for re- drive growth in its pro? table service business and growth of microorganisms is eliminated. This is a continuation of the Deutz ‘growth Speed Logs (DSL) as part of the USCG’s Dop- through acquisition’ strategy, as recently the pler Speed Refreshment Project. Furuno’s DS60 manufacturer of innovative drive systems an- DSL will be installed on more than 200 vessels, nounced its acquisition of the electric drive spe- ranging from 87-ft. Marine Protector-class patrol cialist Torqeedo GmbH. boats to the 418-ft. National Security Cutters, the largest class of vessel in the USCG ? eet. Norautron Group, parent company to technol- Energy Technologies. Inc., is a manufacturer of handling systems for cylinder lubricants when operating in and out of remote operational vehicles (ROV) and has sup- ECAs.